My internship at Andaman Discoveries will almost come to an end. In this blog post I would like to tell you about my last homestay in Ban Talae Nok. I joined two sisters from England who had booked a three day, 2 night tour. I thoroughly enjoyed my second homestay experience and would like to tell you why! I can be short about my relationship with food: I just love eating 😉 I love trying new food that is different from the food back home. 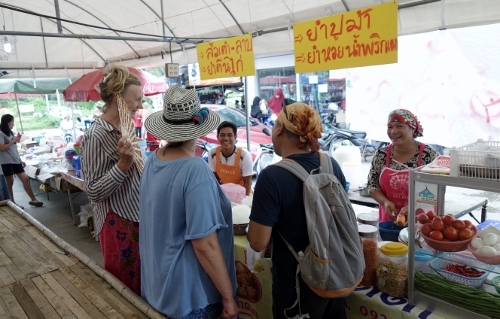 This tour was the opportunity for me to try some home-made Thai food. I think nothing can beat a freshly home cooked meal. Our host Maria cooked us the most delicious food. Each time she would cook multiple dishes and they were all super tasty. I’ve always liked Thai food a lot but I think I even like it better now. It’s not just the food that’s different but also the atmosphere. At night we would eat dinner with the whole family which was incredible. It gave us the opportunity to enjoy our delicious food and interact with the family at the same time. It’s such a different experience than when you just go to a restaurant. There are different homestay homes in the village. The home you’re staying in simply depends on whose turn it is then (they work with a queuing system). We were hosted by Maria. She was so welcoming and kind. Even though she wasn’t be able to eat during the day because of the Ramadan, she would still cook us food and make sure we had everything we needed. It was an honor to stay with her and her family for two nights and get to know all of them a little. It was nice to have a unique insight in what life is like in a rural area in Thailand. The tour guides and villagers that led the different activities were very dedicated to their jobs. They were open to all our questions and liked to show us their village/ craft. It was really inspiring to notice how all these people quickly rebuilt their lives after the tsunami in 2004. They decided to stay positive and tried to move on with their lives which had to be very hard after losing many friends and family. I’m thankful for meeting such wonderful people, listening to all their stories and become inspired by their positivity. The activities were really enjoyable and interesting. When reading through the program beforehand I honestly thought I was not going to like the batik activity on the first day. This however, turned out to be one of my favorite activities. It was fun to try something new and it was very relaxing to work on the batik. Another activity I enjoyed was the soap making. The coordinator of the soap group explained us how to make soap first. Afterwards we made our own batch with her help. I have the recipe now so I will definitely try to make my own soap when I’m back home. The homestay in Ban Talae Nok was a great experience. In my future travels I would definitely want to try to stay in more home stays. I don’t think I would have been able to experience Thailand in a better way than with the two home stays I did. Thank you AD for giving me the opportunity to experience Thailand in this unique way!